German factory orders fell by 2.4% in November compared with the previous month, worse than expected. The euro dropped below $1.176, before recovering slightly. 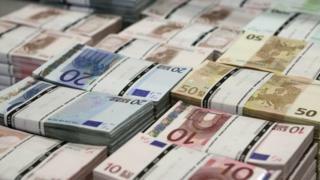 Analysts said increased speculation about extra stimulus measures to combat eurozone deflation also played a part in the euro's drop. If the European Central Bank moves to support the region's economy with quantitative easing, or buying government bonds, as the speculation suggests, this pushes a rate rise even further into the future, making the eurozone less attractive for investors. However, when it comes to possible ECB stimulus measures, CMC Markets analyst Michael Hewson warned that "the biggest concern is that the markets are getting slightly ahead of themselves". The results of upcoming Greek elections could also be spooking investors, he added. On Monday the euro reached a nine year low after ECB president Mario Draghi indicated the bank could soon start quantitative easing.